Condensation – Surface condensation occurs when the temperature of a material falls below the dew point. Where the air reaches a Relative Humidity of 100% it will allow water vapour to change to a liquid and free water will be deposited as condensation. It is important to note that Relative Humidity is a “Proportion” not an amount. The term Relative Humidity refers to the amount of water vapour in the air at any given temperature, expressed as a percentage of the maximum amount of water that can be resident at the same temperature. 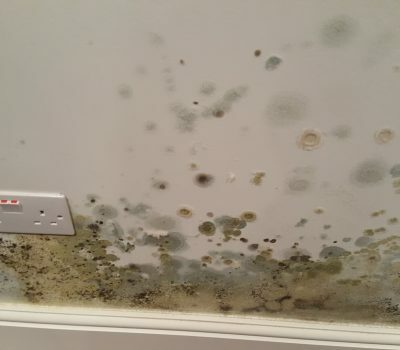 Mould Growths – As mentioned if humidity within a room stays above 70% this can support the growth of moulds. Oxygen and temperature are also important to support mould growths. Lots of people these days will have the heating off all day and then come in from work and put the heating on and cook and use hot water which in turn creates ideal conditions for condensation and mould growths to occur. Drying wet washing on radiators or using tumble driers without correct external venting increases the problem. 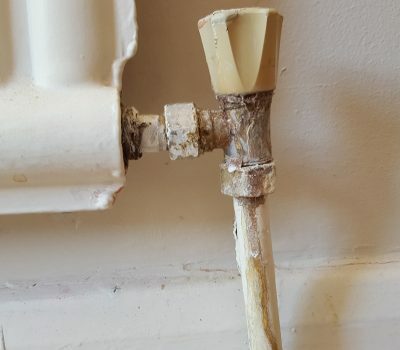 Plumbing Defects – Leaks if left undetected can result in a significant amount of damage and it can often be attributed to rising damp. Careful investigation is needed to find the point of the leak before considering any remedial works. These days our Surveyors have thermal imaging equipment, which can easily distinguish hidden pipes. Where large amounts of water are found we often find evidence of fungi damage to surrounding areas. Sub Floor ventilation – Where timber floors are evident it is essential to check if there is adequate ventilation to the sub floor timbers. A lack of ventilation can cause condensation together with moisture in the sub floor void increasing the risk of fungal decay to the floor timbers. 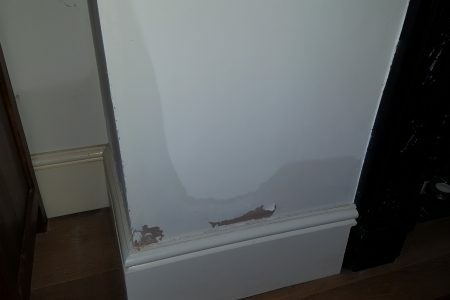 Rising Damp – Rising damp is caused by water from the ground rising naturally by capillary action. There is often a ‘tide-mark’ which is visible normally to a level of 400 – 600mm from the ground, although this can occasionally be higher. The level of wetness within the ground below or adjacent to the wall structure determines the level where evaporation will occur. Over a period, salts may be deposited at the highest point of evaporation. Hygroscopic Salts – Hygroscopic salts – chlorides and nitrates – have the ability to absorb atmospheric water vapour. This often depends on the relative humidity. 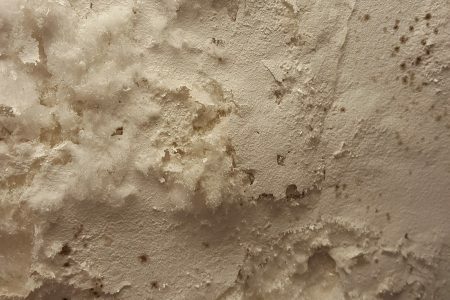 Hygroscopic salts in walls / plaster will absorb atmospheric moisture, which can result in the appearance of damp patches which often come and go. Sulphates, which are often seen as white, fluffy deposits on the surface of a wall is commonly known as ‘efflorescence’. This is different from the chlorides and nitrates which are hygroscopic, moisture absorbing salts. Ground salts such as chlorides and nitrates will normally be found because of rising damp below ground levels. Chlorides in walls may also indicate unwashed sand during building works or sea-water exposure including de-icing salts on the roads during the winter months. 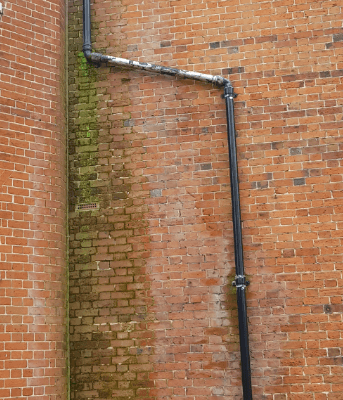 Chimney flues often have high quantities of sulphates in the masonry and again mis-diagnose can occur during a survey from unqualified or inexperienced surveyor. This problem is usually the result of historic burning of fossil fuels. Salt deposits within the flue can become active as a result of water ingress into the flue, or due to interstitial condensation (within the flue). These days with the increase in flooding lots of coastal properties are also suffering with hygroscopic salt contamination. Rainwater Penetration – This can include defective roof coverings, parapets and valley gutters which have not been correctly maintained, together with overgrown vegetation covering walls, spalled brickwork, defective external renders, seals and cracks around windows and doors. Occasionally, we find debris within the cavity brickwork which can occur when the cavity is bridged by debris and/or mortar droppings. Properties which are exposed to wind driven rain or coastal properties are also highly susceptible.